The mission of the English Shepherd Club Registry is to assist the breed community in conserving the English Shepherd breed. 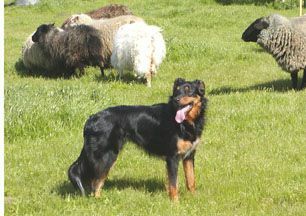 The Online ESC Registry is this state-of-the-art web-based database that provides a single repository for key information about the English Shepherd breed. It is a tool both for the ESC registrar to maintain records, and also for ES breeders and others in the ES community to easily access information about our breed's genetic heritage. You do not have to be a member of the ESC to access the Online ESC Registry or use other ESC Registry services. Anyone who supports the goals and practices of the ESC may apply for an account. Access is free, but the ESC will gratefully accept your tax-deductible donations to help fund the ESC Registry and other ESC breed conservation programs. The Online ESC Registry makes available pedigrees, information about ES farm dogs like what kind of livestock they work, registration numbers from the other ES registries, coat color, date of birth, health information like OFA, PennHIP and MDR1, up to 10 photographs, activities like agility and obedience, intact status, littermates, progeny, siblings and half siblings, and more. The English Shepherd Club is a registered 501(c)3 charitable non-profit devoted to the genetic conservation of a rare American agricultural resource, the English Shepherd breed. In order to advance the goals of breed conservation, the ESC saw that the existing ES registries, as privately owned for profit businesses, were lacking in some respects. The ESC Registry was born out of the desire to serve the ESC's mission of breed conversation with a modern and accessible breed registry. A breed registry that is owned by, and therefore designed to serve the needs of, the ES breed community.